Swansea Trade Unionist and Socialist Coalition (TUSC) are fighting against cuts and for a real alternative. Swansea needs councillors who vote against cuts! No to austerity - vote Trade Unionist and Socialist Coalition (TUSC). 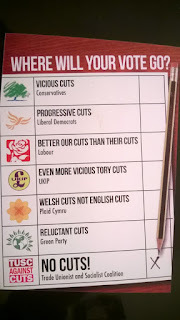 Don’t waste the opportunity to send a clear ‘no more cuts’ message by voting for Ronnie Job, TUSC: the only no-cuts, socialist candidate in Swansea West in the 2015 General Election! The BBC is reporting that a Freedom Of Information request by Radio Cymru has revealed that councils in Wales have cut Meals on Wheels provision by around a third in 5 years. This means that users of this service are not guaranteed a hot meal every day or to see another person; some councils in Wales only deliver a batch of frozen meals once a fortnight. There are Welsh councils which no longer provide this service at all! This is just one more example of how services are cut and service users suffer because the Labour Welsh Government and councils in Wales, no matter which party they're led by, pass on Con-Dem cuts. A Labour victory in the General Election in May will not prevent further cuts being experienced by users of services like meals on wheels; Labour has pledged to continue cuts. No wonder the Welsh Local Government says that councils in Wales, currently making £300 million in cuts, will face continuing austerity for the foreseeable future. 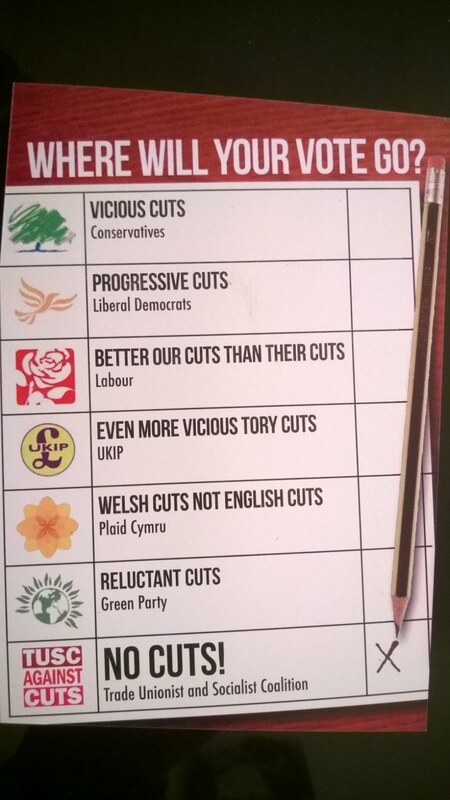 If you've had enough of cuts and being made to pay for a crisis that we didn't cause then you should check out if you're in one of the constituencies in Wales where you can vote for TUSC, the no-cuts alternative, on May 7. TUSC says protect our environment! TUSC: "ordinary people talking sense"
Finally an election broadcast worth watching! Website produced by Swansea Trade Unionist and Socialist Coalition. Simple theme. Powered by Blogger.